To read more, scroll down. To download infographic below, click here. The Our Health Counts, Toronto research project will contribute to the priority area of Applying the “Two-Eyed Seeing“ Model in Aboriginal Health, specifically utilizing “Two-Eyed Seeing” in assessing and improving the health of urban Aboriginal people. The study design provides an opportunity to address the broad gaps in urban Aboriginal health assessment across health domains and lifecycle stages with a focus on a key health care utilization indicator (ER use). Our Aboriginal community partners (Seven Generation Midwives Toronto) and collaborators have made it clear that a comprehensive health assessment that balances wellness and illness measures and looks across the lifecycle and physical, mental, emotional and spiritual health domains is desired, and at the same time the study recognizes the scientific merit and policy relevance of our proposed longitudinal tracking and analytic study of the key drivers of emergency room admissions. This broad approach to the health research is necessary in order to ensure our research meets the dual criteria of Aboriginal community relevance and scientific excellence, and in doing so embodies and puts into action the “Two-Eyed Seeing“ model in Aboriginal health. This project is being led by Dr. Janet Smylie, Director of Well Living House, St. Michael’s Hospital and Sara Wolfe, Community Knowledge User at Seven Generation Midwives Toronto. The Our Health Counts Toronto research project is a 4 year long study that officially began January 2014 and will concluded March 2018 and is funded by the Canadian Institute of Health Research (CIHR). In partnership with SGMT, and guidance and support from the project’s reference group, this longitudinal cohort study will recruit a population based urban Aboriginal cohort of 1200 adults and 600 children using respondent driven sampling (RDS) and develop a comprehensive health status and health care utilization database with the capacity to profile urban Aboriginal individual, family and community health and wellbeing; document unmet health service needs; and track emergency room admissions over time. To determine population based prevalence estimates for key health outcomes for urban Aboriginal adults including general health and life balance; height and weight; physical activity; chronic disease (diagnosis and treatment); sexual and reproductive health (STI diagnosis and treatment, HIV testing, parity); mental health (general self-rated; positive; diagnosis and treatment; Kessler 10; PTSD screen; suicide ideation, attempt family hx); substance use (smoking, ETOH, drugs); culture and identity; stress and coping; parenting stress; disability and multiple morbidities. To determine population based prevalence estimates for key health outcomes for urban Aboriginal children including (for all children) premature birth; breastfeeding initiation and duration; height and weight for age; dental health; immunization status; injury; social and developmental wellbeing. Additional factors for ages 6 and older include: physical activity; chronic conditions; transmission of Aboriginal language and culture; school experiences and performance. To determine population based distributions of key social determinants of health for urban Aboriginal adults and children living in Toronto including income; education; employment; housing adequacy; food security; nutrition; mobility; family and community support; neighborhood environment; historic trauma; residential school attendance; child protection involvement; contact with criminal justice system; adverse childhood events; access to cultural resources; and discrimination. 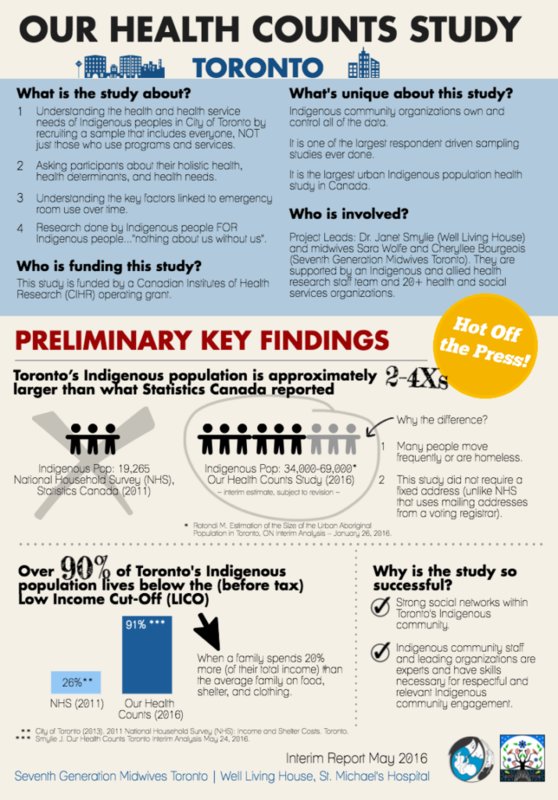 To determine the population based prevalence of self-reported unmet health care needs and their causes among urban Aboriginal adults and children living in Toronto. To determine the patterns of emergency room admissions in this population over a five year period spanning on average 3 years pre- and 2 years post-survey completion. To determine if access to a regular primary care provider and unmet health needs predict emergency room usage in this population and to understand how SES and health status impact these associations. To facilitate the application and dissemination of this health information into ongoing community health policies, programs, services, and evaluations using an integrated KT approach. A prospective analysis of the links between unmet health needs, access to primary care and ER access, which has been previously identified as elevated for urban Aboriginal populations.